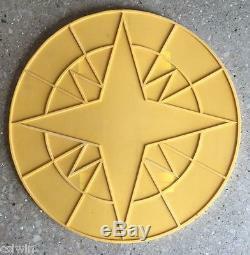 Compass Star concrete stamp accent piece 24 inch. Uniform 1/4 inch grout line on outer edge and interior. Thank you for your interest in decorative concrete supplies from Walttools/Contractor Source. In addition to stamping tools, we offer a complete line of additional decorative supplies including integral color, color hardener, and a variety of decorative release agents. We also offer acid stain, water base stains, and water base dyes, along with many other products. To complete the job we have a dozen decorative sealers to tailor the final finish of your project. Our knowledgeable staff looks forward to supplying you with decorative concrete products and technical assistance. Walttools brand decorative concrete supplies is a full line of professional grade concrete tools and consumables that have been produced with the contractor in mind. They combine the highest quality materials with ease of use to ensure the job at hand gets a fair shake. Their tools and supplies have been used extensively by contractors in the U. And Canada for projects ranging from new installations of decorative concrete in both residential and commercial settings, to a wide range of restoration type projects in countless settings. To date, contractors in more than 40 countries have found value in Walttools. The original line of texturing tools is unmatched in texture quality and workmanship. Walttools texture tools are always U. Made with materials chosen for durability and reliability. Products are always subjected to regular quality control methods. Beware of any online tools or supplies that seem a bit "homegrown" because you don't want their problem with quality control to become your problem with quality control. It takes years of manufacturing experience to engineer product lines that can withstand the test of time and stand out from the rest. Don't be fooled by the pretender. What is a rigid stamp and what is a floppy/flex stamp? A rigid stamp is one that is semi-rigid and has handles. It is designed to work with others like it for the majority of the texturing job. They will support your weight in properly staged concrete or overlayment. The floppy/flex is the same size and shape but is made from a more pliable material to allow you to use it where the standard mat cannot be bent into place (such as with walls, along edges, and other obstacles). What is a touch up skin? A touch up is a small (approximately 14 inches) piece of similarly textured material WITHOUT grout lines to enable quick and easy correction of missed and/or improper textures. Do I need a release agent? A release agent is critical to use any texturing tools in fresh concrete. Release agents come in a clear liquid or a powder, and is available in several colors. How many stamps should I get? The general rule is to be sure you have enough stamps to line up across the widest part of your project, along with a stamp or two to start a new row. For example, let's say you have a patio that is 12x16 feet and you want to use the Roman Cobble Stamp in the 12 foot direction. That stamp is 30 inches long, so you need 5 stamps to go across that side. Therefore, you will want at least 6 rigid stamps in your set so you can start the next row. You should NOT count the floppy as an inline stamp. Do I have to follow a color pattern? Each stamp in a pattern has a certain color, but all the stamps in the set will fit with each other properly no matter the color. As a rule of thumb, you should avoid placing too many of the same color stamp next to each other to avoid an overly-repetitive look. NOTE: Seamless skins are not color coded. This is the hardest question of all. All concrete cures out at different speeds and is very dependent on time, temperature, humidity, and other factors like wind and sun. Stamping needs to occur during the "plastic" state. This is when the surface is soft enough to accept an impression, yet firm enough to support the weight a bit. The concrete will continue to stiffen once starting and force of "tamping" in the tools will need to increase throughout the process. Check out the Walttools website for more information. Tools are for fair use only. You are hereby forbidden to copy, either in whole or in part, any Walttools' texture stamps, texturing tools, form liners, rollers, or any tool apparatus otherwise found on this site. Those found in violation will be subject to persecution and damages to the full extent of the law. The item "Compass Star accent concrete stamp 24" is in sale since Friday, August 18, 2017.